The technical details of the missile are still classified. 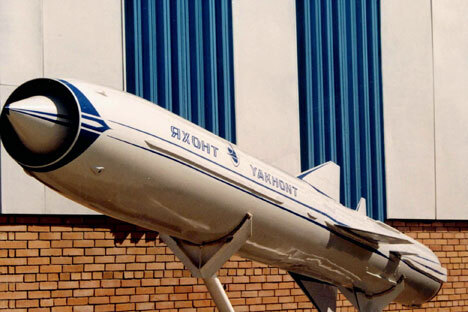 Military experts assume that it could be a completely new development by Russian designers as well as a product upgrade based on a rocket already being used like the Yakhont. In September 2014, the final tests were run on Russia’s newest cruise missile, which has been developed by NPO Mashinostroyenia, a part of the Tactical Missiles Corporation. According to the General Director of NPO Mashinostroyenia, Alexander Leonov, the new missile was designed for the Russian Navy and, in addition to the completion of state testing of the rocket itself two sets of ground-based and sea-based missiles have also successfully passed state testing. Nothing is currently known about the name, index, or even any of the tactical and technical characteristics of the new product. According to Dmitry Kornev, the chief editor of the internet project MilitaryRussia, despite all of the secrecy surrounding the recently tested missile, it is already possible to make some presumptions about the product in question. It could be a fundamentally new missile, perhaps, hypersonic. One should not forget that NPO Mashinostroyenia has been actively working in this area and it was not too long ago mockups of the joint Russian-Indian hypersonic rocket BrahMos-2 appeared at exhibitions,” Kornev told RIR. Also, in Kornev's estimation, this could be about the modernization of a missile already in service. In this case, a new, more accurate control system created using modern components and computational algorithms was most likely installed. It is also possible that the so-called homing device was replaced, he suggested. If we are talking about an upgraded product, then most likely this is the P-800 Onyx known in export market as the Yakhont, according to Kornev. This is the most famous supersonic missile produced by NPO in the world market. The BrahMos supersonic missile system and the Bastion coastal missile system were created on its basis. According to Boltenkov, putting the new universal missile system into the service of the military will significantly enhance the power of the Russian Navy. At the same time, both experts noted that even though the facts about the new product are still secret, it is already possible to presume that the new rocket has the potential for export. Several countries, in particular Vietnam and Indonesia, purchase Russian missile systems, both sea and land-based. The Vietnamese Yakhonts that are supplied as part of the Bastion coastal missile system are, according to some reports, capable of hitting both sea and land-based targets. Boltenkov pointed out that the Sopka and Rubezh Soviet coastal missile systems were supplied to more than ten countries around the world and were even used several times in the course of military conflicts, for example, in the Arab-Israeli conflict. Vice Admiral of the United States Navy Michael Connor voiced concerns about the growing potential of the Russian submarine fleet in The Inquisitr. The reason for his concern was the testing of the Bulava intercontinental ballistic missile, one of the launches of which was successfully executed in September of this year. When it was launched from the centre of the Arctic Sea, the newest ICBM overcame several thousand kilometres of distance to successfully hit its target in the Kura testing grounds located in the Far East.